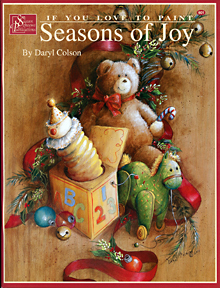 Acrylic We are excited to feature a NEW artist, Daryl Colson. Daryl's book is brimming end to end with delightful beautiful painted projects. 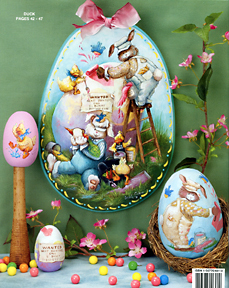 Easter eggs painted with painting bunnies and ducks. 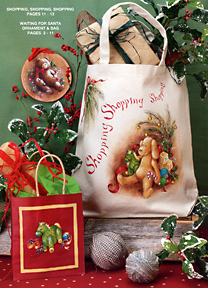 Christmas designs with bears, toy pony, jack in the box, ribbons, bells, berries, candy canes and a load of joy painted on a sled, christmas ornaments and shopping tote. Mr. & Mrs. Claus each painted on their own sled. 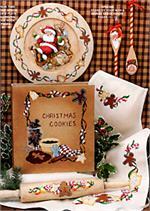 Christmas Santa cookie plate. Christmas cookies, recipe notebook and rolling pin. 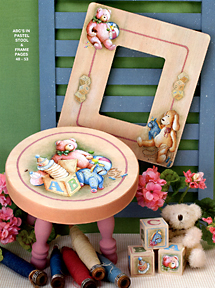 Paint a project for new baby, a childs stool, frame and designer building blocks with a bear, jack in the box, toy pony and building blocks. Wishing you a Happy Thanksgiving plate. Mr. & Mrs. scarecrow with sunflowers and crows is adorable. 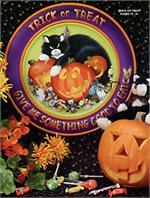 Trick or Treat plate with a black cat draped over cute pumpkins, mice dressed in halloween costumes with candy trick or treating. 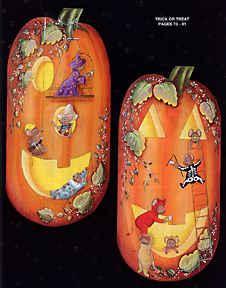 Pumpkins with halloween costumed mice are one of my personal favorite projects. 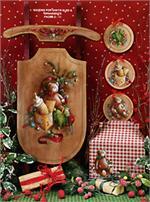 How to paint, step by step instructions.